A friend who works in a restaurant in one of Glasgow’s posher suburbs tells me that Peter Lawwell, the Chief Executive of Celtic FC and a frequent customer, is quite nice on a personal level. That’s the thing about those at the top, the bankers, CEOs and politicians – most of them are perfectly polite if you happen to bump into them. But pleasantries aside, it doesn’t stop them being utterly ruthless bastards when it comes to the things that really matter. Like many football clubs, the origins of Celtic are steeped in mythology. “If you know the history, it’s enough to make your heart go sad…” blares the PA system at every home match, and ask any ‘tic fan what “the history” is and they’ll no doubt be able to fill you in on how the club was set up as a charitable effort “for the maintenance of the dinner tables for the children and the unemployed” in Glasgow’s impoverished east end towards the latter end of the 19th Century. It’s the kind of thing which allows Celtic fans, players and board members alike to claim that we’re “more than a club” – and for a community which has suffered centuries of discrimination, Celtic remain an important symbol of Irish identity and heritage in Scotland. Fast forward to 2013, and poverty still blights the East End of Glasgow. With Celtic being a major employer in the area, it would surely follow that they would pay their own staff enough to “maintain their own dinner tables”, particularly in light of statistics which show that most of those in poverty are in work. Such was the intention of a motion put before the club’s AGM last month, which would have ensured all employees receive at least the Living Wage of £7.45 an hour – the basic amount required to cover living costs. The disconnect between the mythology of Celtic FC and the reality of Celtic PLC became glaringly apparent as the motion, proposed by campaigning shareholders’ group the Celtic Trust, was voted down by the mass block vote of Peter Lawwell and his chums. Celtic FC: alleviating poverty through poverty pay since 2013. Lawwell explained that to bring the 180 sub-£7.45 an hour employees (so presumably discounting the high number of outsourced staff employed by the likes of G4S on match days) up to the Living Wage would cost around £500,000 a year. Small change for a football club with pre-tax profits of £9.74m this year, less still for a director whose annual remuneration comes in just short of £1 million? Shameful stuff, but there was a catch which the media at least could jump on even if everyone else saw through it instantly. The catch being that, wait for it, most of the 180 are just part time staff, so why should Celtic be paying them more when they all have other jobs anyway?! Lawwell may live in a fantasy world where part time service sector staff spend their weekdays in “other jobs” with gold plated salaries and just come along to Parkhead at the weekend to punt overpriced merchandise and lukewarm pies for the fun of it, but unfortunately the rest of us to do not. The idea that part time work at a football stadium is a jolly weekend pastime for anyone defies the nature of precarious work in the 21st century. It was all beginning to look a bit embarrassing for the board of directors, home of such social justice luminaries as Brian Wilson and, not so long ago, Lord Reid. But as every tinpot dictator, has-been Labour politician or tabloid editor knows, the only thing to do in such a situation is to find a distraction and react to it with such enormity that it sidelines any other discussion. Fortunately, such a distraction was just around the corner. Step forward the Green Brigade, a couple of ‘controversial’ banner displays, some broken seats and a flare. 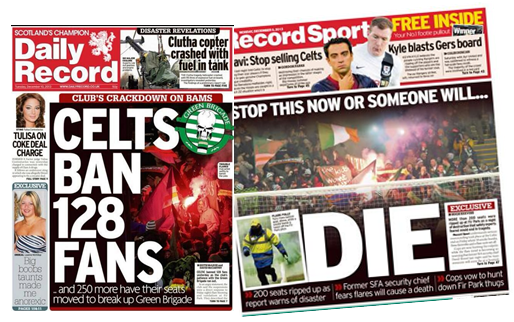 Few could have foreseen quite how quickly things would escalate to their current point – with anti-fascist ‘ultras’ group the Green Brigade all but forced out of existence, or at least any presence at Celtic Park, by the actions of the club. Some background is probably useful in explaining how we got here. It’s a situation which has been bubbling up for nearly two years now, since the SNP’s showpiece “anti-sectarian” Offensive Behaviour at Football Act was pushed through the parliament in April 2012. Widely rounded on as a poorly thought out mess of a law, full of gaping holes over what comes to be deemed as “offensive”, this hasn’t stopped Police Scotland trying their hardest to enforce it. But enforcing an unworkable law isn’t the easiest job, particularly when existing legislation was more than sufficient at dealing with er, offences… So instead the police have chosen some selective targets to make it look like they’re doing something. When it comes to Celtic, that’s primarily involved throwing charges at those seen singing the Roll of Honour, a tribute to the ten Irish Republican hunger strikers who died in 1981. Read the lyrics and judge for yourself if any reasonable person would be “offended” if they heard it in the vicinity of a football match (for that’s the basis of the law), but you’ll be hard pushed to find any sectarianism or religious hatred, unless that’s what calling England “a monster” is. The result of this has been that the Green Brigade have been pushed into singing Roll of Honour as a point of principle; whether this has been the wisest move or not is really not the point. 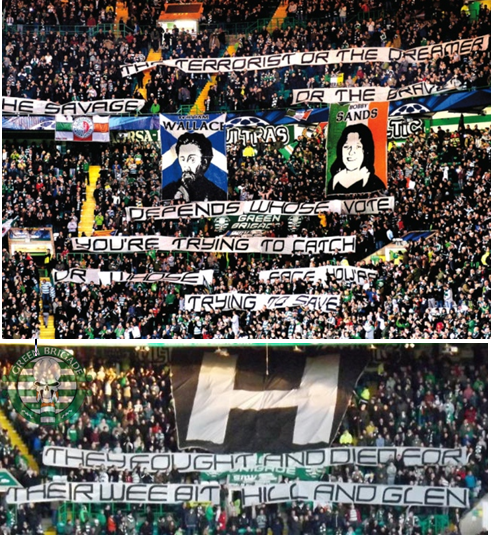 In recent weeks, two banner displays have made reference to this, highlighting the irony that Celtic supporters are being prosecuted under a law proposed by the SNP, a party who to this day idolise dubious “national liberation” figure William Wallace and, in fact, close their conference every year by singing Scots Wha Hae, an ode to er… fightin’ the English! It’s lucky there’s no football going on, or the lot of them could find themselves locked up under their own law. Maybe they should have seen it coming. Alas, most onlookers in civil society, fellow fans and the media alike seem to have deliberately missed the finer nuances of the point the Green Brigade were seeking to demonstrate about Scottish Government hypocrisy. No, instead all they saw was a massive banner of BOBBY SANDS!!!!! Matters weren’t helped when 10 days later, a Friday evening game at Motherwell’s Fir Park saw extensive damage to seating and a flare chucked on the pitch. Not particularly big or clever, nor however was it the actions of the Green Brigade, who did still accept responsibility that much of the overcrowding had taken behind their banner and that they should have self-policed more effectively. We are a non-political organisation… Regardless of political views people hold, football stadia should not be used to promote these. I can’t quite believe I’m about quote Gandhi, but I believe it was him that said “poverty is the worst form of violence”. That’s poverty – primarily caused by low pay – equating to violence, Mr Lawwell, not broken seats and a picture of Bobby Sands. But nevermind that, SOMEONE WILL DIE!!!! Saturday’s dreich match against Hibs was the first post Green Brigade. True to Lawwell’s word, no politics were tolerated. Punters were turned away for wearing Green Brigade scarfs, a ‘Vote Yes’ banner was confiscated and someone was told to remove a scarf commemorating Nelson Mandela, just days after minutes’ applause were held in his remembrance all over Europe, including at Celtic Park. (The same Nelson Mandela, that is, who was directly influenced by the actions of one Bobby Sands. It’s a funny old world.) Another one which blares out across the tannoy at every home match is “Let the People Sing”, a rallying cry about how the music of Ireland’s people, their stories and their songs, have outlasted “famine and oppression”. Be that as it may, they couldn’t contend with Lawwell’s “reputation” police, who are still perfectly willing to package up Irishness and sell it back to people when it suits them – and they’ve been quite happy to co-opt much of the Green Brigade’s chants, songs and aesthetic for merchandising and other purposes too. The tragedy is that, amid a manufactured furore over sixty broken seats, one of the most exciting things to happen at Celtic Park over the past few years – the emergence of the Green Brigade – has been ruthlessly destroyed by Lawwell and his vested interests of ‘respectability’, corporate sponsorship and raking in profits. We’re led to believe that what makes Celtic special, “more than a club”, is its spirit of community and charitable origins, its emblematic role as a focal point of Irish identity and culture in Scotland, and the passion of its fans and the atmosphere at Celtic Park, said to be among the best in Europe. 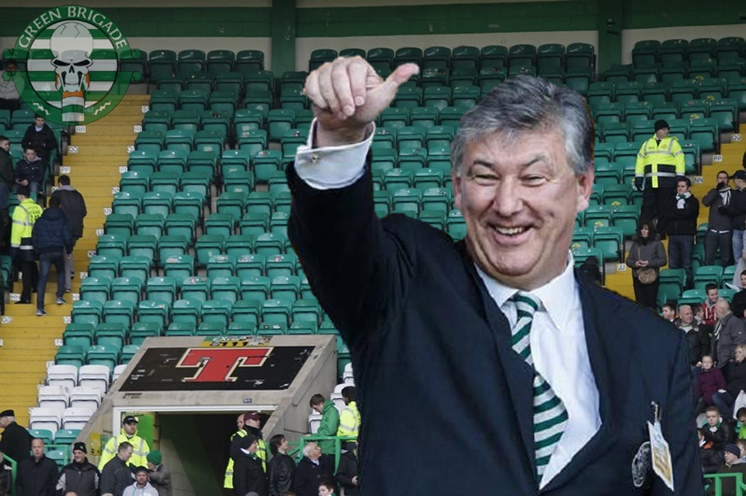 In one fell swoop, Lawwell is seeking to erode all three. He’s a wanker.